“This is another important step in our expansion programme for our ‘diagonal corridor’ services to and from Belfast. Stena Forecaster will help us continue to deliver a reliable and high-quality service to our freight customers. 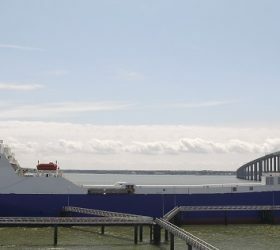 The 3,000 lane metre ship will help to boost capacity ahead of next year’s exciting introduction of the first of two new, larger E-Flexer ships which are currently under construction in China. The new ships will significantly raise both freight and travel capacity and as well as service levels,” says Paul Grant, Trade Director Irish Sea North. Stena Forecaster will make two departures daily Monday to Friday and will partner the two RoPax vessels StenaLagan and Stena Mersey on the Belfast-Liverpool route.